We’ve made such a mess of the suburbs we constructed in the last fifty or so years that one wonders whether they can ever be made into something more sustainable. Strip malls, traffic jams, cookie-cutter subdivisions, diminished nature, almost no sense of outdoor community. We all know the drill: there are nice places to be in America’s recently built suburbs, but we have to know where they are and drive to them through a visual and environmental mess to get there. One of the most challenging aspects of suburbs, and of the prescriptions for improving them, is the character of their roadways. Most of us take the poor design of our streets – the most visible part of most suburban communities, if you think about it – so much for granted that it never occurs to us that they actually could be made better for the community and for the environment. Consider, for example, main "arterial" streets so wide that pedestrians can’t cross them, even if there is a reason to; little if any greenery to absorb water, heat, or provide a calming influence; or residential streets with no sidewalks. 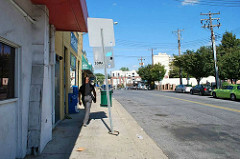 This is where Montgomery County’s new street-scape initiative comes in. 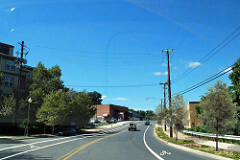 Just northwest of Washington, D.C., Montgomery has had its ups and downs accommodating and managing tremendous growth. 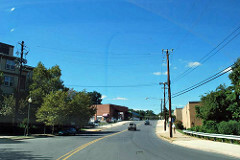 But there is no question that it has done some things right, including the preservation of much of its farmland – in part by channeling growth into the central districts of Bethesda and Silver Spring, both served by D.C.’s rail transit system, and more recently by encouraging walkable redevelopment along the notoriously sprawled-out Rockville Pike corridor. As a result, Montgomery has actually been in the business of "retrofitting" or "repairing" the suburbs (very gradually, to be sure) since before planners began to call it that. Now, it has undertaken a pilot study on two stretches of roadway in the county to evaluate the use of green infrastructure – strategically placed vegetation and other methods that reduce polluted runoff by using or mimicking natural hydrology – along with measures to better accommodate pedestrians and bicyclists. One is an arterial road that goes through residential areas, the other a wide commercial street. 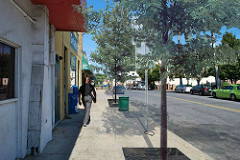 Both showed there was much potential, and Montgomery is now planning to integrate more environmental features into its streets. Streetscapes and public rights-of-way are valuable real estate, although people often forget they are not just about moving motor vehicles. They are also the front doors to homes, schools and businesses. As Montgomery County urbanizes and its spaces become more constrained, planners are re-considering how to create more value from our street-scapes. The Planning Department conducted a year-long project on environmental site design focused on street edges. ESD integrates site design, natural hydrology, and other controls to capture and treat runoff. In addition to collecting drainage and waste water, roadsides accommodate utilities, as well as provide space for pedestrians and off-road bicyclists, but trees and natural vegetation have often taken a back seat to other uses. Montgomery hired SvR Design Company, a Seattle-based firm with extensive experience in green infrastructure and complete streets planning, to advise the initiative. Many of the images accompanying this post were contributed to the planning effort by SvR to illustrate the possibilities. Note that the changes are not extensive, for the most part, but incremental: subtle narrowing of traffic lanes to slow auto speed; plantings in medians, along sidewalks and in parking lots to capture and filter rainwater; bike lanes and wider sidewalks to accommodate non-motorized users; striping to mark a people-first pedestrian lane where a sidewalk may not be feasible. 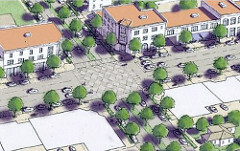 There’s a lot to like about Montgomery’s initiative, including that it brings together three relatively new and successful – but often independently successful – lines of sustainability thinking and planning: redesigning suburbs; green infrastructure; and “complete streets” that accommodate all types of users. It reminds us that the greatest potential for sustainable communities lies with the integration of ideas and purposes. I hope this kind of initiative continues to catch on.